Self-Care & Coping Emphysema Prevention Stop-Smoking Now! - Emphysema is a chronic (often fatal) lung disease involving damage and decline in funtionality of lung air sacs which occurss in stages and impacts breathing. There is an ongoing destruction in stages of alveoli and surrounding lung tissues. 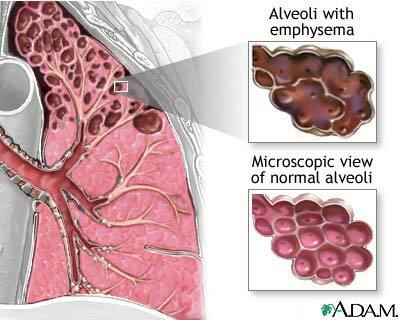 With advanced emphysema the large air cysts develop where normal lung tissue used to be. Air is trapped in the lungs due to a lack of supportive tissue, which in-turn decreases the amount of blood oxygenation. 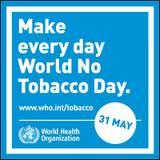 Smoking accounts for 85% of all people who pass-away attributable to emphysema, lung disease and lung cancer. Far and away cigarette smoking is the number-one cause of emphysema, lung cancer and lung failure. When exposed to cigarette smoke, the air sacs of the lungs produce defensive cells, called macrophages, which "eat" the inhaled particles. But macrophages are stimulated to release materials which can destroy the proteins that let the lungs expand and contract, called elastin and collagen. Quitting smoking and avoiding second-hand smoke can prevent the occurrence of emphysema and at least slow the lung disease down if it's already underway. Other changes to your environment, such as avoiding smog and air pollution, may also help prevent the development of emphysema, or at least keep it from getting worse. By now, most people are well aware that smoking causes lung cancer. Cigarettes, pipes, cigars, and chewing tobacco end-up causing over 500,000 Americans to pass-away yearly, accounting for one out of every five early deaths in the USA. Lung cancer is just the first in a long list of tobacco related serious (too often they are fatal) health issues and illnesses, which include "emphysema" a very serious and often chronic medical condition. Even the skin can be damaged by smoking. Most people don't realize long-term cigarette smoking causes premature aging of skin. Many of the 4,000 chemicals in tobacco smoke also damage collagen and elastin, which are fibers giving skin its strength and elasticity. As a result, skin begins to sag and wrinkle prematurely due to smoking. It's also widely believed smoking contributes significantly to arteriosclerosis and heart disease. There is also considerable and much researched evidence of other medical conditions attributable to smoking, which medical research and the gathering of doctors evidence is ongoing. Emphysema and Lung Cancer are being researched heavily with the latest nano-technology research but until now there are unfortunately no verified major medical break thru's to report at this time. An emphysema related condition is Chronic Obstructive Pulmonary Disease (also known as COPD), a general term for a group of diseases which cause progressive damage to your lungs. These diseases include chronic bronchitis, asthma and emphysema. Of the approximate 20-million plus Americans with C.O.P.D. it is estimated more than 3-million have symptomatic emphysema and millions more are in the early stages of the chronic lung disease before easily recognized signs and lung disease symptoms appear. Unlike asthma, which occurs when the muscles in your airways tighten, emphysema causes a loss of elasticity in the walls of the small air sacs in your lungs. Eventually, the walls stretch and break, creating larger, less efficient lung air sacs that aren't able to handle the normal exchange of oxygen and carbon dioxide. When emphysema is advanced, you must work so hard to expel air from your lungs that breathing becomes difficult and breathing can consume as much as 20 percent or more of your resting energy. Unfortunately, because emphysema develops gradually in stages over the years, you may not experience typical emphysema symptoms such as shortness of breath until irreversible lung damage has already occurred. Instead of an emphysema cure, emphysema treatment focuses more on relieving emphysema symptoms and avoiding serious complications. The main symptoms of emphysema are shortness of breath, breathing difficulty and reduced capacity for physical activity, both of which are likely to become worse as the disease progresses. In time, you may have trouble breathing even when lying down, and it may be especially hard to breathe during and after respiratory infections, such as the common cold, or the flu. Mild cough or chronic cough. You may produce mucus or phlegm when you cough hard. Loss of appetite and weight loss. It's a vicious cycle. Emphysema can make eating more difficult, and the act of eating can rob you of your breath. The result is that you simply may not feel like eating much of the time. Fatigue. You're likely to feel tired both because it's more difficult to breathe and because your body is getting less oxygen than it needs. When you inhale, air goes to your lungs thru 2 major airways called bronchi. Inside your lungs, the bronchi divides similar to roots of a tree into a million smaller airways (bronchioles) which ends in clusters of tiny air sacs (alveoli). You have about 300 million air-sacs in each lung. Within the walls of the air sacs are tiny blood vessels (capillaries) where oxygen is added to your blood and carbon dioxide — a waste product of metabolism — is removed. The air sac walls also contain elastic fibers that help them expand and contract like small balloons when you breathe. Effects of emphysema - What happens? In emphysema, lung inflammation destroys these fragile walls of the air sacs, causing them to lose their elasticity. As a result, the bronchioles collapse, and air becomes trapped in the air sacs, which over stretches them and interferes with your ability to exhale (hyperinflation). In time, this overstretching may cause several air sacs to rupture, forming one larger air space instead of many small ones. Because the larger, less-elastic sacs aren't able to force air completely out of your lungs when you exhale, you have to breathe harder to take in enough oxygen and to eliminate carbon dioxide. The process works something like this: Normally, you exhale in two ways, actively and passively. When you exert yourself and need more oxygen, your chest muscles contract, forcing air out rapidly. On the other hand, when you sit quietly, your diaphragm contracts and your chest muscles expand to take air in, but your muscles don't actively contract to let the air out. Instead, the elastic tissue around your air sacs contracts, and your lungs passively shrink. But if you have emphysema, many of these elastic fibers have been destroyed, and you must consciously force air out of your lungs. The forced exhalation compresses many of your small airways, making breathing and expelling air even more difficult. Most common emphysema cause is unsurprisingly smoking! Cigarette smoking is by far the most common cause of emphysema. The damage begins when tobacco smoke temporarily paralyzes the microscopic hairs (cilia) that line your bronchial tubes. Normally, these hairs sweep irritants and germs out of your airways. But when smoke interferes with this sweeping movement, irritants remain in your bronchial tubes and infiltrate the alveoli, inflaming the tissue and eventually breaking down elastic fibers. In a small percentage of people, emphysema results from low levels of a protein called alpha-1-antitrypsin (AAt), which protects the elastic structures in your lungs from the destructive effects of certain enzymes. A lack of AAt can lead to progressive lung damage that eventually results in emphysema. AAT deficiency is a hereditary condition that occurs when you inherit two defective genes, one from each parent. Although severe AAt deficiency is rare, millions of people carry a single defective AAt gene. Some of these people have mild to moderate symptoms; others have no symptoms at all. Carriers are at increased risk of lung and liver problems and can pass the defect to their children. People with two defective genes have a high likelihood of developing emphysema, usually between the ages of 30 and 40. The progression and severity of the disease are greatly exacerbated by smoking. Experts recommend that people with early-onset emphysema — especially those who don't smoke or have other risk factors for the disease or who have a family history of AAt deficiency — be tested for the defective gene. People who are found to have a genetic predisposition for AAt deficiency may want to consider having close family members tested as well. Pulmonary function tests (PFTs). These non-invasive doctor tests can detect emphysema before you have symptoms. They measure how much air your lungs can hold and the flow of air in and out of your lungs. They can also measure the amount of gases exchanged across the membrane between your alveolar wall and capillary membrane. During the test, you're usually asked to blow into a simple instrument called a spirometer. 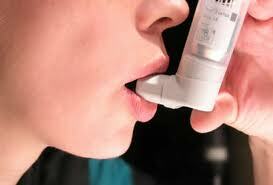 PFTs may be done before and after the use of inhaled medications to test your response to them. If you're a smoker or a former smoker, ask your doctor about taking this test, even if you don't have symptoms of emphysema or COPD disease symptoms. Chest Xray. 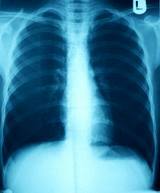 You're likely to have a chest X-ray to help rule out other lung problems rather than to diagnose emphysema — even in the advanced stages of emphysema disease, chest X-rays are often normal. Arterial blood gases (ABG) analysis. These blood tests measure how well your lungs transfer oxygen to your bloodstream and how effectively they remove carbon dioxide. Pulse oximetry. This test involves use of a small device that attaches to your fingertip. The oximeter measures the amount of oxygen in your blood differently from the way it's measured in blood gas analysis. To help determine whether you need supplemental oxygen, the test may be performed at rest, during exercise and overnight. Sputum examination. Analysis of cells in sputum can help determine the cause of some lung problems. Computerized tomography (CT) scan. A CT scan allows your doctor to see your organs in 2-dimensional images or "slices." Split-second computer processing creates these images as a series of very thin xray beams are passed thru your body. A Cat scan can detect emphysema sooner than an xray can, but it can't assess the severity of emphysema as accurately as a pulmonary function test. You feel short of breath most of the time. You can't breathe well enough to tolerate even moderate exercise. You frequently cough up sputum that's colored and possibly infected. These signs and symptoms don't necessarily mean you have emphysema, but they do indicate that your lungs aren't working properly and should be evaluated by your doctor as soon as possible. Most cases of emphysema are due to smoking. If you smoke — cigarettes, cigars or a pipe — your chance of developing emphysema is much greater than for nonsmokers. The best way to prevent emphysema is to not smoke or to stop-smoking. In addition, try to limit your exposure to secondhand smoke. Although smoking is the most common cause of emphysema, occupational exposure to chemical fumes and dust also is a risk factor. Try wearing a dust mask for protection if you work in such an environment. Emphysema: Does Cold Weather Make it Worse? Wear a cold-air face mask when you are outside. You should put the mask on before going out. Cold-air face masks are available at many drugstores and medical supply stores. If you don't have a mask, wear a soft scarf pulled over your nose and mouth. Breathe in through your nose instead of your mouth when you are outside. This helps warm and humidify the air before it enters your lungs. Use your bronchodilator about 30 minutes before going outside. A bronchodilator helps open constricted airways. Before making a permanent move from a warm climate, your doctor may suggest that you spend some time in a cold climate to see how it affects your breathing and emphysema disease.